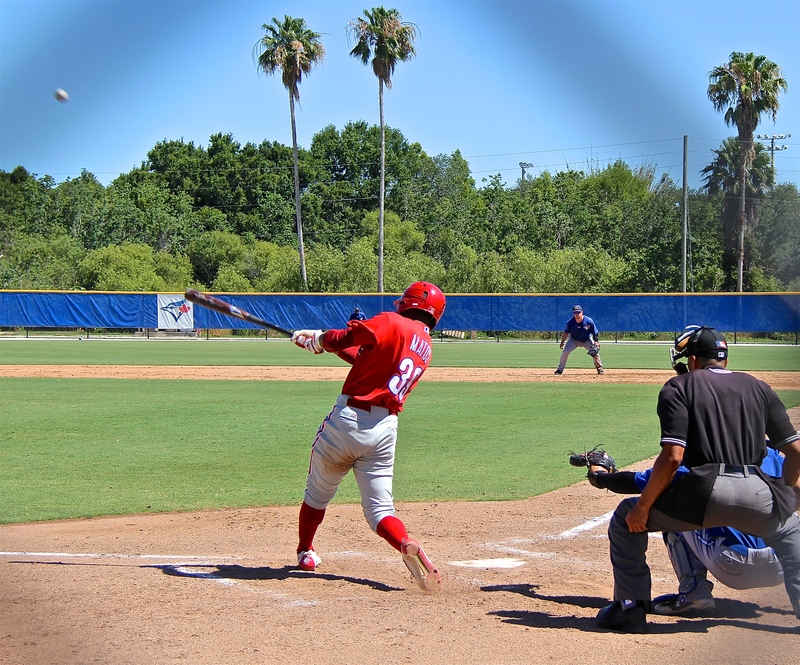 With the AAC championships tying up the fields at the Carpenter Complex, all of the Phillies XST games were on the road last week. The following reports and photos were forwarded to me courtesy of Mark Wylie. Thank you Mark. Kyle Young started for the Phillies and pitched well. Attached are two photos of him pitching in the game. At 7′ tall, it looks like he is halfway to home plate when he lets the ball go. He was at 91 mph in the first inning. Definitely an imposing figure on the mound. His command is good, and he displayed a nice curve ball in the game on Thursday. First off, let me say it has been extremely hot and humid this May in Florida. Last week had several days in a row of record breaking temperatures, and we are in a drought, so we haven’t gotten the daily, late afternoon thunder-boomers which cool things down just a little bit. The guys in extended Spring Training have to deal with the blazing sun, high temps, and humidity on a daily basis. It is impressive watching the quality of their play and seeing them hustle all of the time, knowing how physically demanding playing in Florida can be. Pitching: Kyle Young started for the Phillies. The seven-footer had difficulty locating the plate with the lead off batter in the box. He walked. Kyle wild pitched him to second base, and an infield single that was knocked down by the second baseman scored the runner from second. 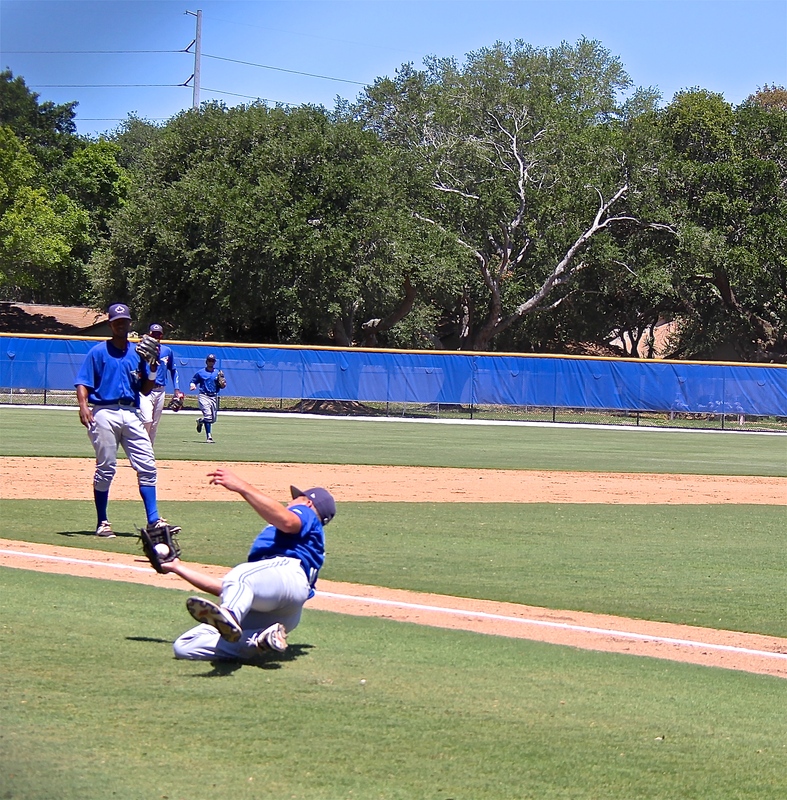 The batter tried to get to second on the throw home, and Rodolfo Duran threw him out for the first out of the inning. 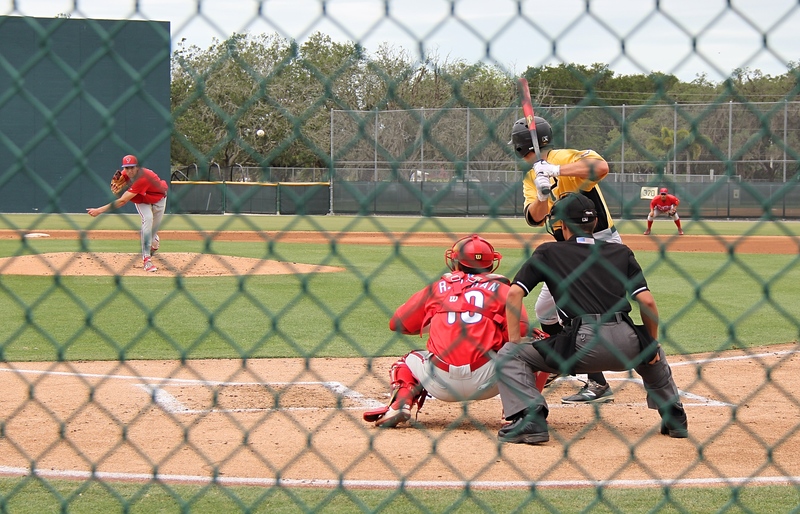 Kyle Young then settled down and seemed locked in as he struck out the next batter swinging at a 91 mph fastball, and then struck out the last batter of the inning swinging at a curve ball. In the bottom of the second inning, Kyle got two batters to ground out to the second baseman, and struck out another swinging at a curve ball. 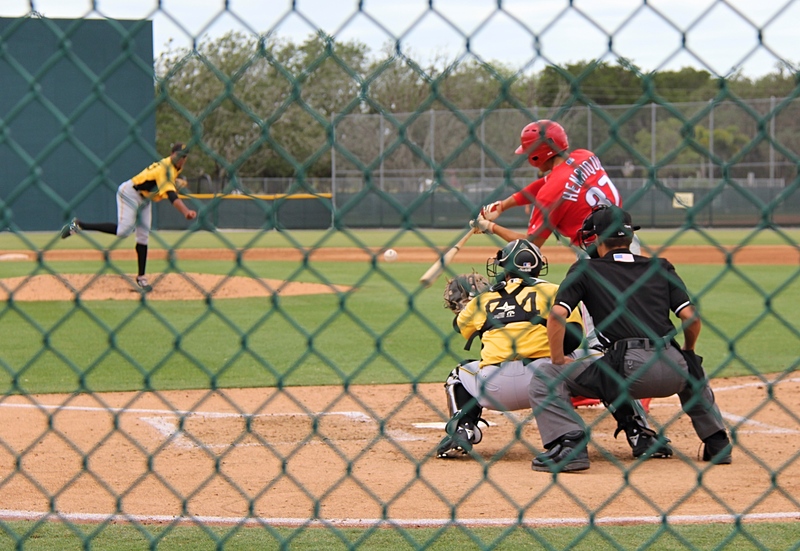 In the third inning, which was his last inning, Kyle threw just five pitches as he induced ground outs to the shortstop, third baseman, and second baseman. Overall, it was a very impressive performance. 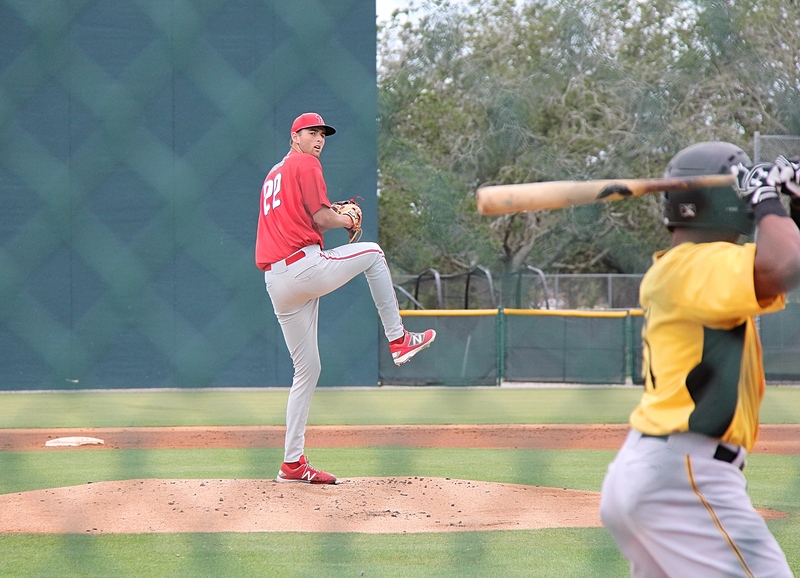 In the bottom of the fourth inning, Victor Sobil entered the game for the Phillies. He threw hard and had a 1, 2, 3 fourth inning with two swinging strikeouts and a grounder to third. In the fifth inning, a leadoff walk and a double to the left field corner led to the Pirate’s second run. Victor then settled down and struck out two batters swinging and another batter grounded out to the first baseman. In the sixth inning Sobil got Pirate batters to fly out to right field, ground a seeing-eye single to right, strike out swinging at a fastball, and ground out to third. Victor had a nice fastball during his outing. Robinson Martinez (#84) came on to pitch for the Phillies in the bottom of the seventh inning. His control was a little off as he walked the first batter of the inning. He then gave up a double to the right field corner that put runners on second and third. After a pop fly to the shortstop, A wild pitch scored the runner from third and the runner on second moved one to third base. After back to back walks, the inning was rolled. Score at that point was 4-3 Phillies ahead. In the Pirate 8th, back to back well hit triples tied the score and led to a pitching change with a runner on third. Tyler Frohwirth came on with the score tied, no outs, and the go-ahead runner on third base. Tyler struck out the first batter looking at a nice curve ball on the outside corner of the plate. 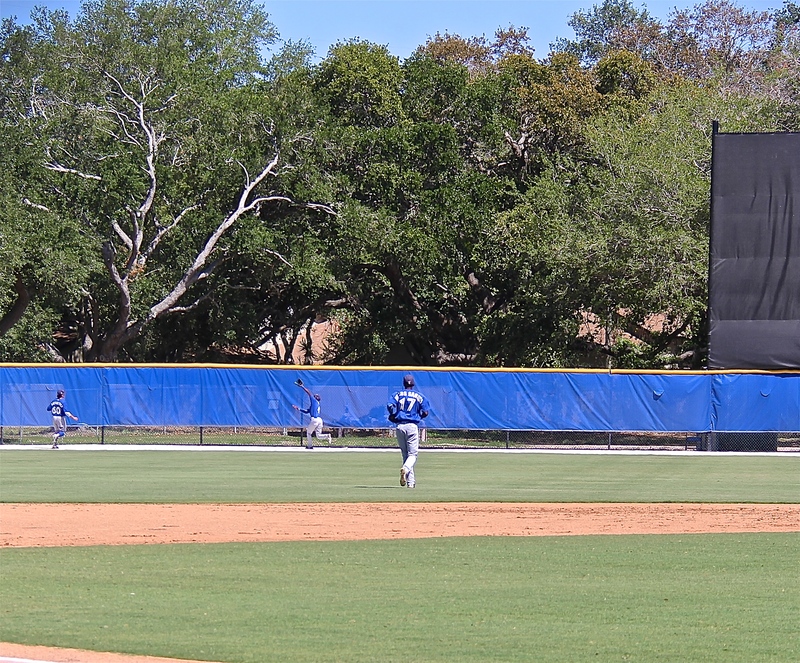 The next batter sent a long fly ball to right center field that Juan Luis from center field and Jhailyn Ortiz converged on from right field. 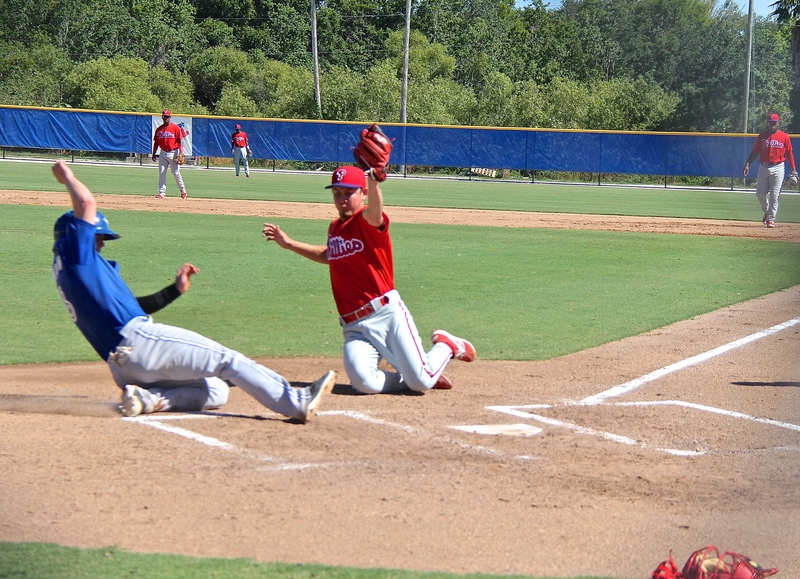 As a collision was imminent, Luis slid to avoid it, just as Jhailyn was reaching on the full run to try to snag the ball. Luis rolled up on Jhailyn’s lower leg and both players went down as the Pirate batter circled the bases and two runs scored. It was a scary looking collision and the Phillies’ coaching and training staffs were out in a flash to attend to both players. 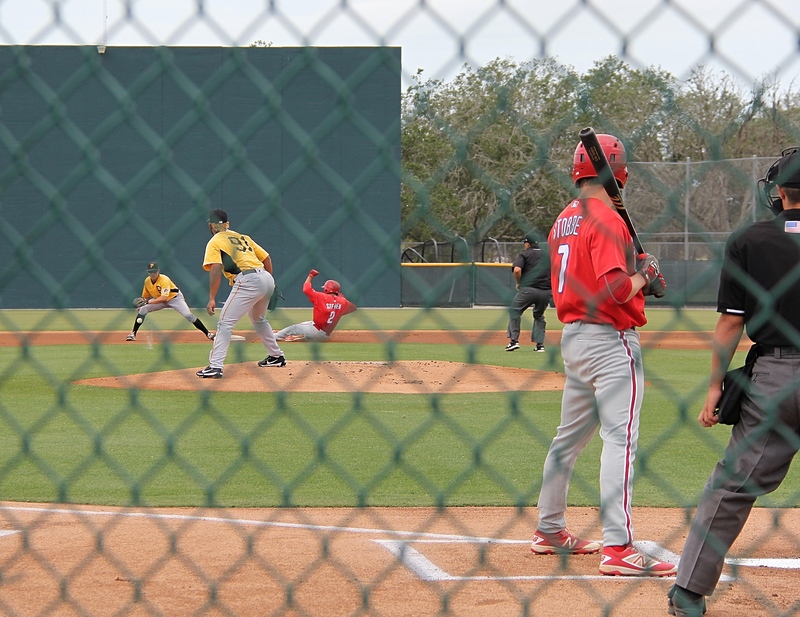 Luis was up fairly quickly and after a several minute delay, the three Phillies trainers had Jhailyn on a golf cart the Pirates sent out. 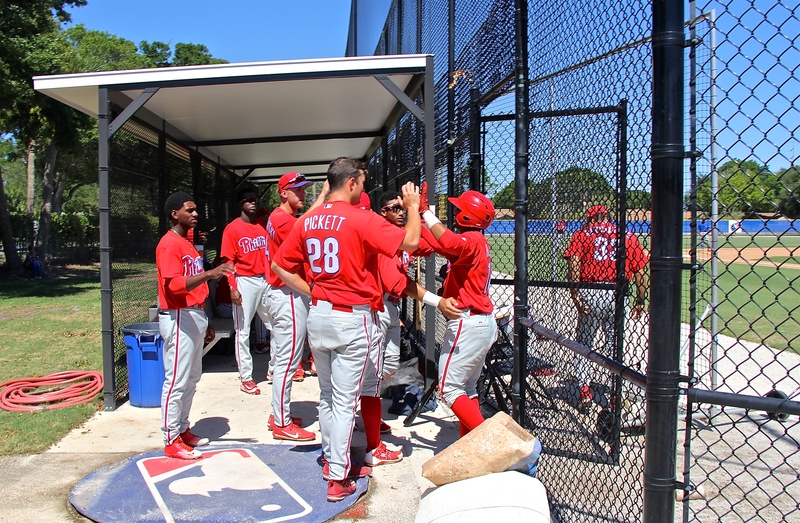 The Phillies training staff was impressive with how quickly they attended to both players. Kudos to them!!! Juan Luis stayed in the game. With the bases now empty, the next batter hit a double to right center. A pop-out to shortstop and a groundout to the pitcher ended the inning. The Bucs led 6-4 at this point, and that would be the final score. The Phillies had a fair number of hits in the game, but couldn’t string them together for a big inning. 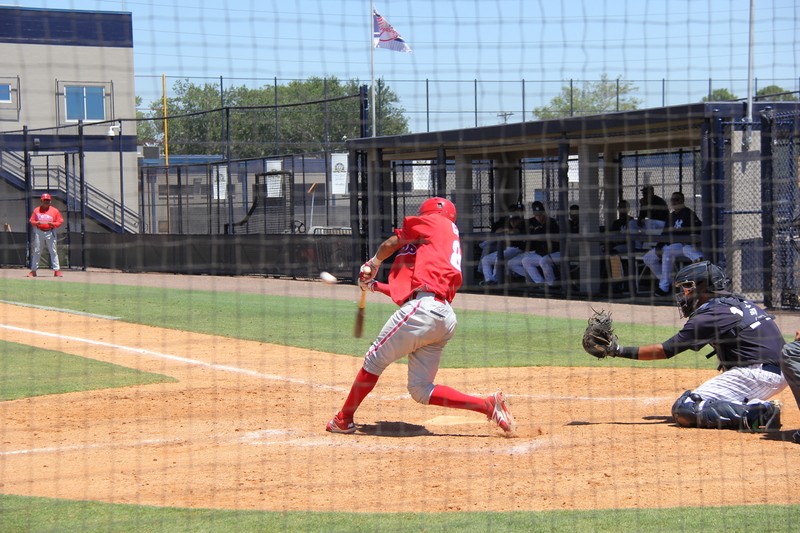 In the top of the first, Josh Stephen sliced a soft liner on a two-strike pitch on the outside portion of the plate into left field for a single. He then easily stole second base on the first pitch, but was left stranded there. Josh was 1-2 for the day. Josh has been playing. Batting second in the line up, he adjusts his swing with two strikes to slice a pitch on the outside corner of the plate to left field for a base hit. Josh easily stole second on the first pitch. He had a huge jump. 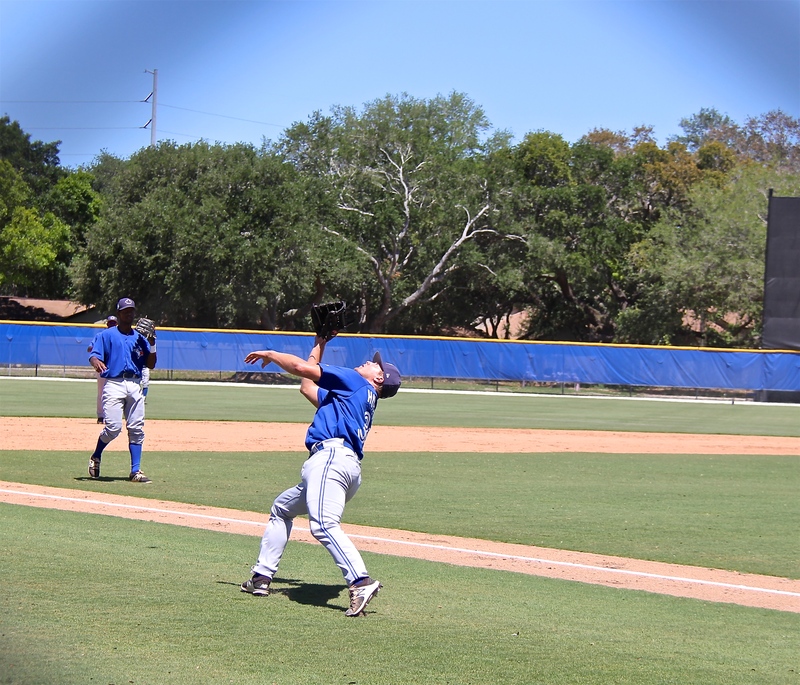 The catcher rushed his throw. You can see it kicked up some spray as it one-hopped the fielder. Cole Stobbe was 1-2 with a double he lined into the left field corner. Rudolfo Duran was 1-2 with a run scored. His hit was an infield single up the middle. Luis Encarnacion was 1-4 with a run scored. His hit was a hard hit double to right center field. 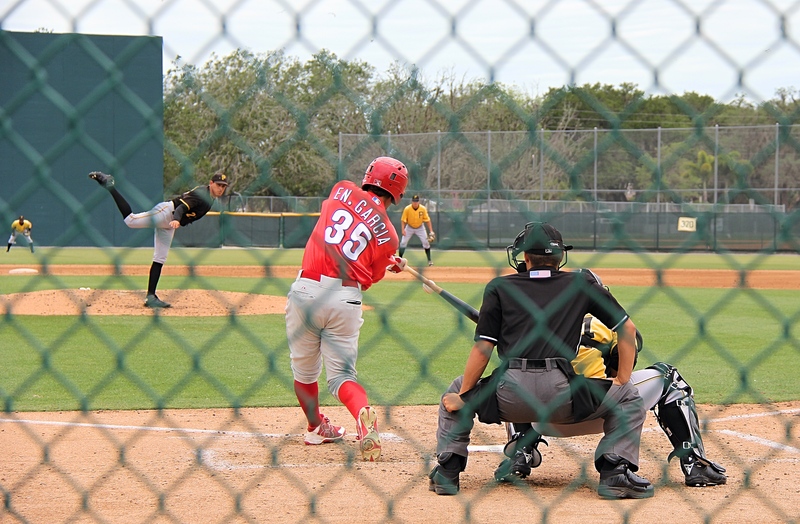 Jesus Henriquez had two line drive singles in three at-bats, and 1 RBI. Jhailyn Ortiz was 1-3 with an RBI. His hit was a two-strike line-drive double to left field. Enmanuel Garcia was 1-2 with a run scored. His hit was a double to the left field corner. Brayan Gonzalez was 1-3 with 2 RBI’s and 2 runs scored. 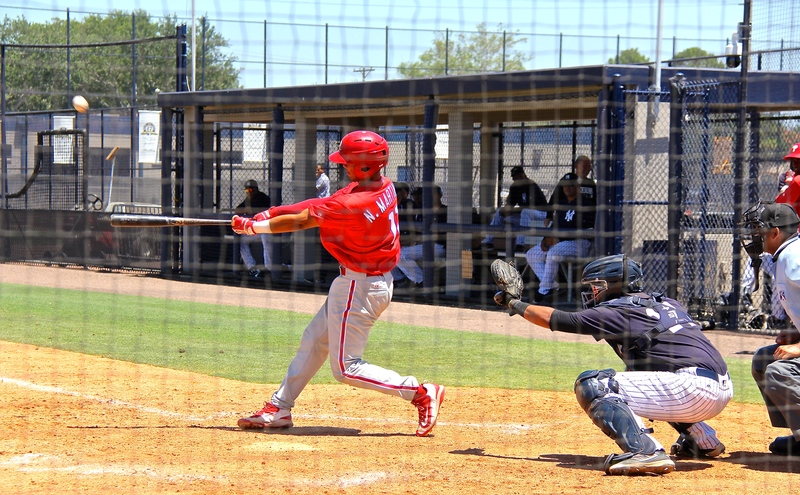 He lined a double to the right field corner in the Phillies three run fifth inning. 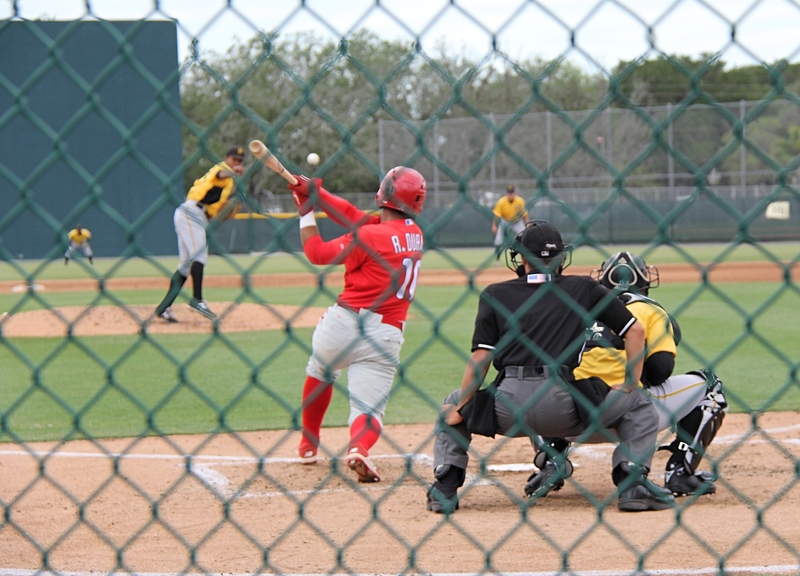 Malvin Matos was HBP in the front of the helmet in his only at-bat. As a precaution, the training staff wisely and immediately removed him from the game. Malvin was back in the lineup for Saturday’s game in Dunedin. Greg Pickett was 1-3 along with a BB. His hit was a ninth inning double lined to the right field corner. The notorious I-4/I-275 holiday weekend traffic in Tampa stopped me in my tracks. I sat in my car in a traffic jam on I-4 for an hour, and by the time I arrived at the Yankees’ complex in Tampa, the game was in the bottom of the 4th inning with the Yankees ahead 3-2. I guess the bats were waiting for me to arrive, since the final score ended up being 13-7 in favor of the Phillies. Since i got to the game halfway through it, I didn’t bother to keep track of the pitchers going into/coming out of the game, but I do know that lefty Jose Jimenez pitched well for the Phillies. Victor Arano pitched two innings at the end of the game, but was on a strict pitch limit for each inning, so the 8th and 9th innings were rolled. The Yankees also had a pitcher pitching on a rehab assignment, with a strict pitch limit, and they rolled an inning or two, so it evened out. Since I didn’t see the Phillies bat in the first four innings, these observations/stats are limited. 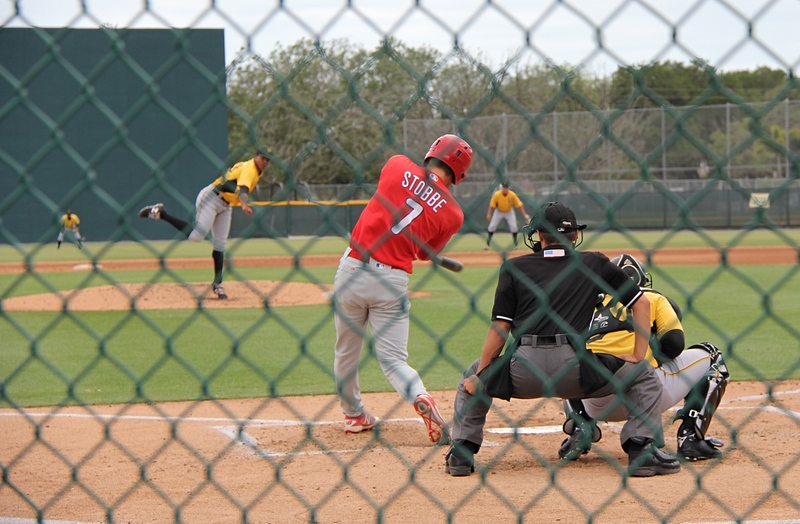 Substitutions were already being made in the top of the 5th or the 6th innings, so I didn’t see Cole Stobbe or Josh Stephen bat, and have no idea how they fared on the day. 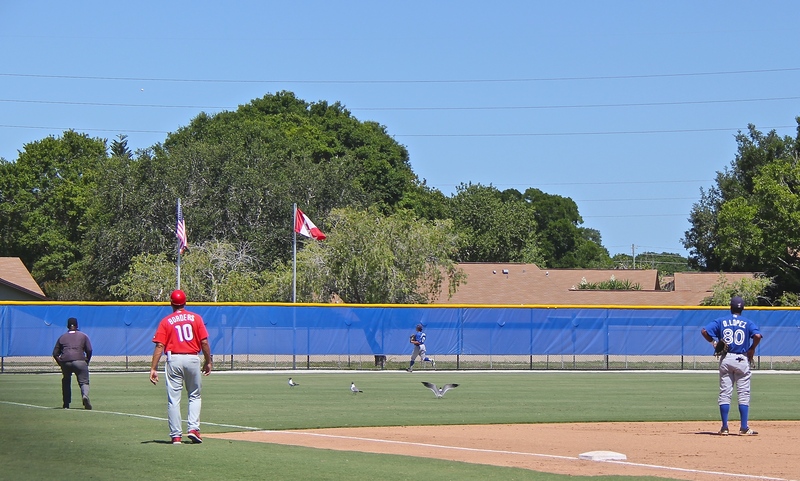 There were many hitting stars for the Phillies in the at-bats I did see. 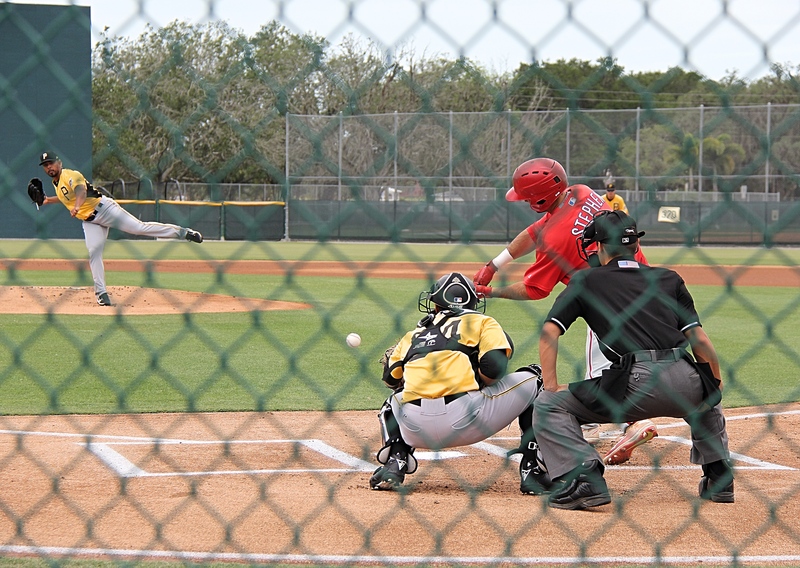 In his two at-bats that I saw, catcher Nerluis Martinez hit a double and a grand slam homer with six RBI’s. Jonathan Guzman Had a double and a triple (over the center-fielder’s head in right center field). Simon Muzziotti had a timely sac fly to bring Guzman home after his triple. 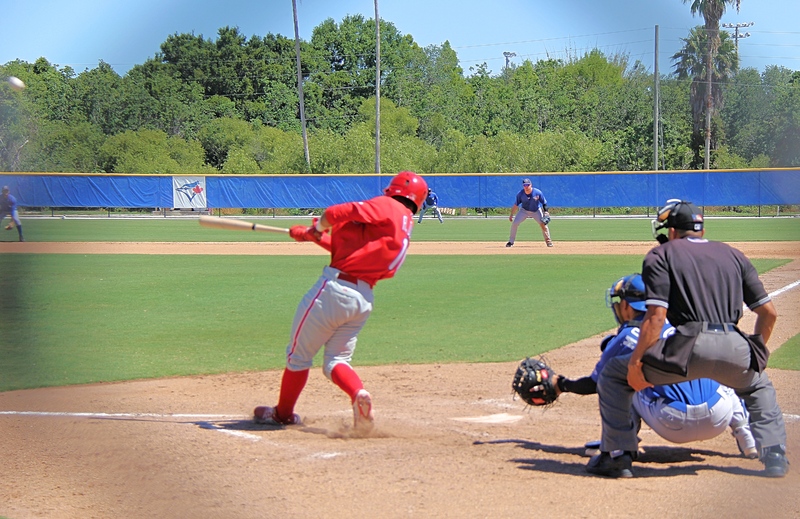 Ben Pelletier had 2 singles, including a bunt single on a sac to move the runners over from 2nd and first. The Yankees had a rotation play on and Ben put down a perfect bunt on the third base line and beat the throw over to the second baseman who was sprinting over to cover first. Caleb Eldridge had a solid double to left center and a line drive single to right. 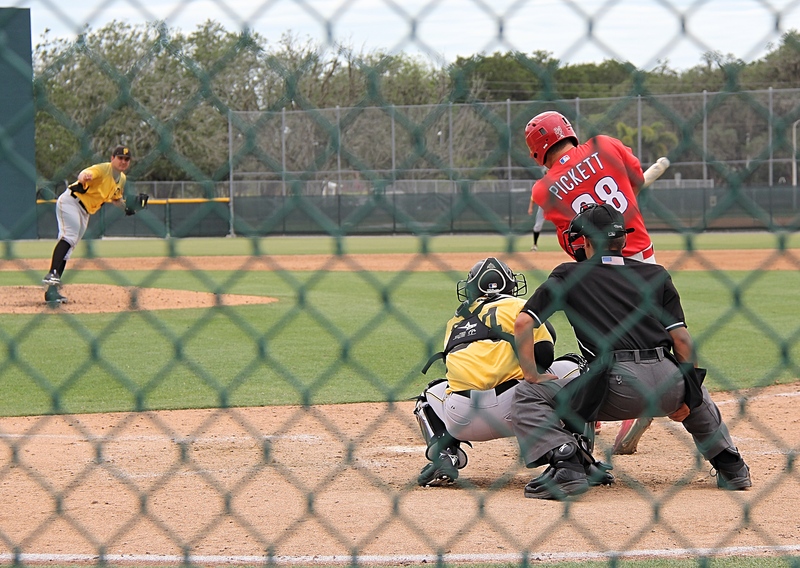 Greg Pickett ripped a double to left and a line drive single to right. Andrew Brown started the game for the Phillies. He had a 1, 2, 3 inning in the first with a spinning strikeout. Andrew ran into a little trouble in the Jays’ second. Mattingly Romanin led off with a high chopper single to short. He then stole second base. Andrew Brown then got the first out of the inning on a called third strike. The next batter grounded out short to first for out number two. On the play, Romanin took third. 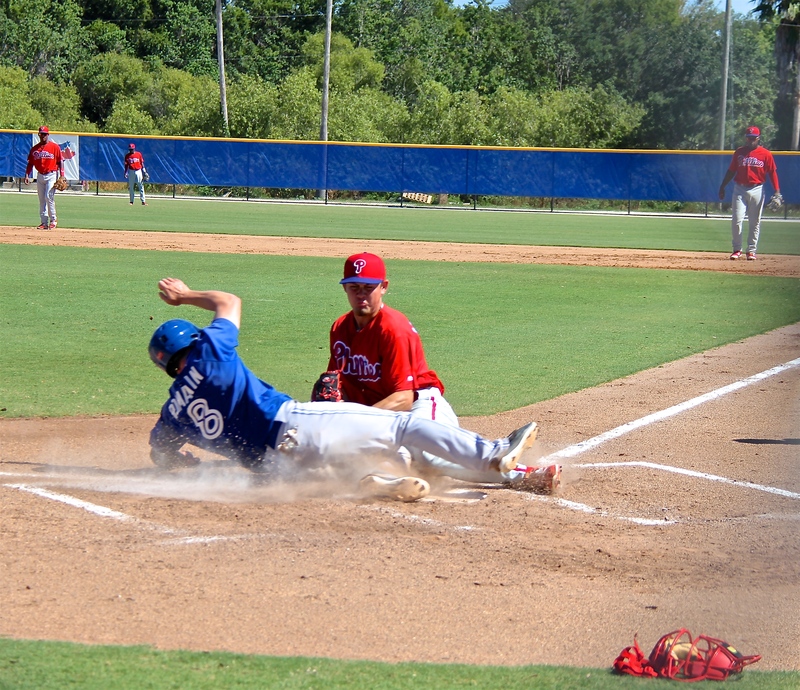 Romanin scored on a close play at the plate on a wild pitch. The next batter had a single that he tried to stretch into a double, and was tagged out after he over-slid second base. Andrew Brown showed a nice curve ball in the game, but ran into more trouble in the Jays’ 3rd. A bunt single, a line drive single to center, and a HBP loaded the bases. A 6-3 ground out scored one run, and a BB loaded the bases again. Another 6-3 ground out plated a second run in the inning. A swinging strikeout ended the inning as well as Brown’s morning. At this point, the Phillies trailed 3-0. Rafael Carvajal pitched in the 4th & 5th. Rafael pitched consecutive 1, 2, 3 innings in the 4th and 5th innings. He struck out two batters swinging, and he induced 3 fly ball outs, and one ground out to 2nd. Justin Miller started the 6th and had a quiet 1, 2, 3 inning: two groundouts to third and a strikeout looking on a nice slow curve ball. Anton Kuznetsov started the 7th. 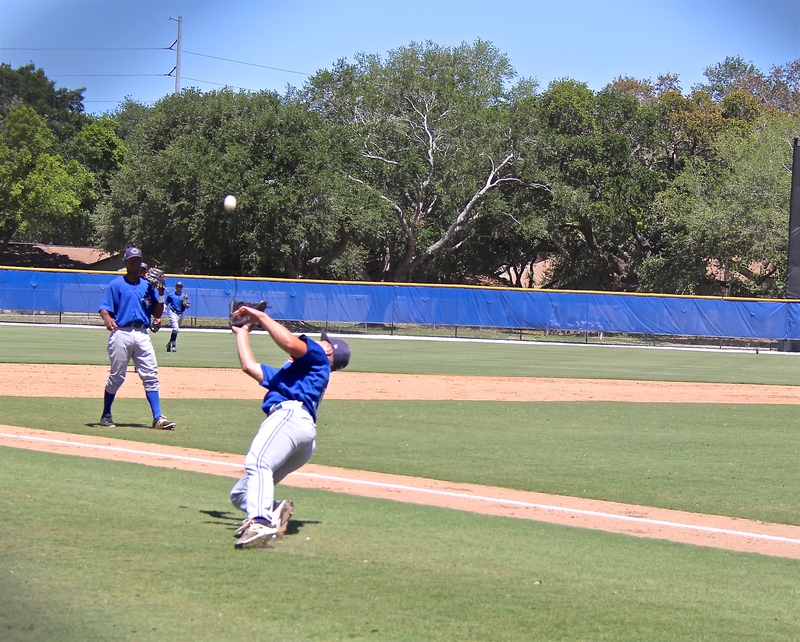 Anton had a 1, 2, 3 inning: a pop-up to second base, a swinging strikeout on a curve ball, and a ground out to second. He liked using his curve ball. Denny Martinez came into the game at the start of the 8th. The Jays pushed across an unearned run in the 8th on an infield single, a line drive single to center, an error by Keudy Bocio at third, and a sac fly to right. 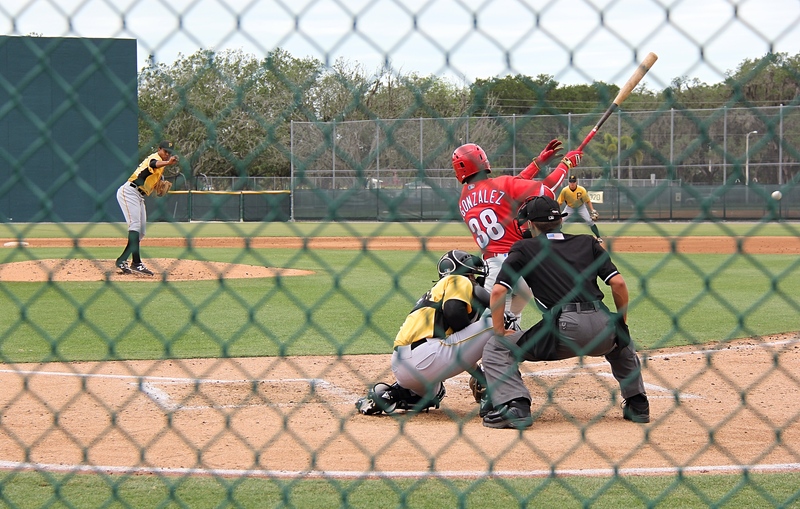 Martinez struck out one batter swinging, and also induced a pop-up to the second baseman. The Blue Jays scored four runs on six hits, 2 BB, 1 wild pitch, and 1 Phillies error. The Phillies didn’t hit. Just 3 hits on the day. 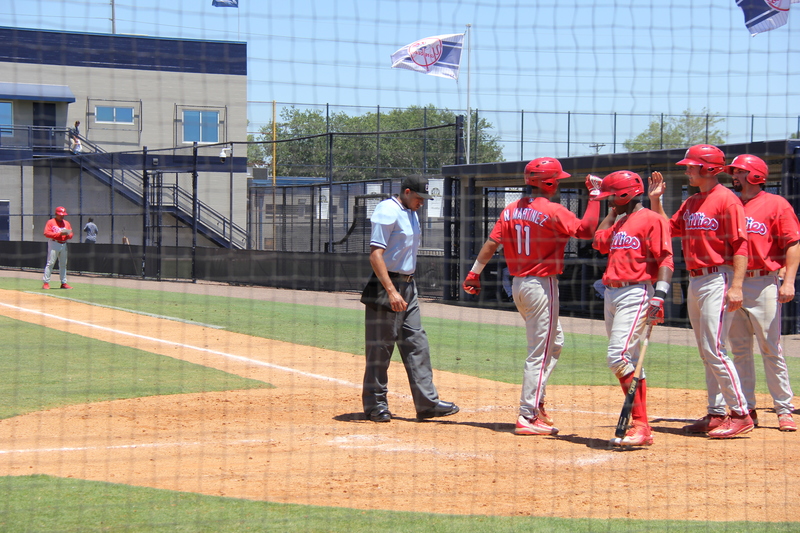 Rodolfo Duran had a mammoth home run to left field in the 5th inning. It was the Phillies first hit of the game, and it cleared the left field fence as well as two perimeter fences, and landed in a yard across the street. I don’t know if you will be able to see it, but the ball is between the top and middle power lines, to the left of the U.S. flag. It was one of the longest minor league home runs I have ever seen. I worked for the Atlanta Braves AAA team in Richmond in 1986, when they won the International League championship, and I saw a lot of home runs, but few, if any matched Duran’s shot on Saturday. Rodolfo hits everything hard! Jesus Alastre had a double to left in the 6th. Malvin Matos had a line drive single to right in the 7th. Matos lost an extra base hit after the Jays center fielder made a running catch into the fence on a drive to deep left center field in the 4th inning. There was a bright, high sky on Saturday with no clouds, so every pop-up/fly ball was an adventure. The Jays third baseman lost a foul pop-up in the sun when he wasn’t wearing sun glasses. Grayson Huffman, the last Jays pitcher in the game had to call a Luis Encarnacion pop-up in foul territory on the third base side after neither the third baseman, nor the catcher could find the ball in the sun. Huffman lost track of the ball on the way down, and made a circus catch diving backwards. It was one of those days. Is Ortiz ok ? That would really be bad . Jhailyn is fine. He started yesterday’s game in right field against the Braves. He even had a stolen base, so his ankle/leg must be feeling good now. Who have been the best kids in XST? I am particularly interested in Pickett, Stephen, Gowdy and Young but would like to hear about anybody that has shown some potential. Young hitting 91 is actually a big deal, he had been an 88/89 guy. 91 with his size and stuff could lead to a very good pitcher. Those guys must be going crazy. Only a few more weeks. Great report….good to hear how Rodolfo Duran strikes the ball. Maybe another great low cost signee at $75K in J2-’14 out of the DR..